Since FAO Schwarz, the monstrous New York City toy store, announced that it will be closing its Fifth Avenue location, toy fans have been mourning the loss of a childhood staple. But there's no use crying over the end of an era, especially when you can learn about its history instead. The Schwarz brothers opened their first retail toy store in 1862 in Baltimore, Maryland. After seeing its success, Frederick moved to New York City in 1870 and opened Schwarz Brothers Importers at 765 Broadway in Greenwich Village. In 1880, the name was officially changed to FAO Schwarz. In 1875, FAO Schwarz, then called the Toy Bazaar, brought a live Santa into the store around Christmas time, inspiring stores like Macy’s to do the same. The toy store has occupied seven different locations around Manhattan. The flagship store finally settled down at 767 Fifth Avenue in 1986. For 55 years before the move, the store was a two-minute walk away at 745 Fifth Avenue. Currently, one of the most expensive items available is the full size Buffalo from Hansa’s Woodland & Prairie Collection, which goes for $2,649.99 (with an additional shipping cost of $299.99). According to the store’s website, the buffalo can be ridden by anyone under 150 pounds and is best for children aged 3-10. On December 11, 1980, The Washington Post published “The Consumer Affairs Committee—Americans for Democratic Action 9TH ANNUAL PRICING SURVEY” which compared the prices of 88 toys sold at 24 D.C.-area stores. The survey found that Milton, an electronic talking game from Milton Bradley, cost $58.97 at K Mart compared to $110 at FAO Schwarz. For decades, a 6'7" cuckoo clock sat perched over the store’s windows. In 1989, it was auctioned off at Sotheby’s. In a 1989 article in The New York Times, FAO Schwarz toy buyer Ian McDermott said that the clock “cuckooed for a year before the Fifth Avenue Association persuaded George Hecht, then the owner of Schwarz and of Parents Magazine, to silence the bird." The article explained that “Complaints had been made by the head of Bergdorf Goodman across the street about the clock chiming and cuckooing on the hour." The giant piano featured in Big (1988) wasn’t the original from the store. 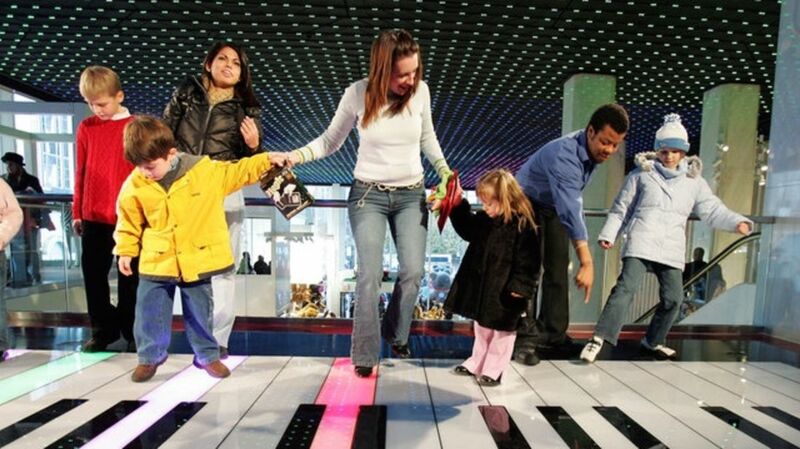 In an interview with The New York Post, director Penny Marshall explained that she had to have a special keyboard made because the one at FAO Schwarz didn’t play the notes needed for the songs “Heart and Soul” and “Chopsticks.” So, she employed the same piano maker with the task of making a new one with a greater range. "Welcome to Our World of Toys" played from the jolly “Humpty Dumpty” clock in the store’s entrance from 1986 to 2004. In October 1985, when the video game market was in its post-Atari crash, FAO Schwarz became the first U.S. retailer to sell the Nintendo Entertainment System (NES). The console was originally released in Japan in 1983 as the Famicom. FAO Schwarz entered bankruptcy in 2003 and again in 2004—they even had to briefly close the store from late January to Thanksgiving Day of that year. Then, in 2009, it was purchased by Toy’s 'R' Us. In 2004, The New York Times article “F.A.O Schwarz Closes, Disappointing Visitors” cited Toy’s 'R' Us as one of the “discount toy retailers” responsible for FAO Schwarz's demise.